European lawmakers are grappling for answers to a question that until recently seemed like the stuff of science fiction: If robots take our jobs, who will pay taxes? In an age of unprecedented technological change occurring at a faster rate than the Industrial Revolution, concerns over the growing robotization and automation of work have prompted fears about mass unemployment and plummeting tax revenue in the near future, pitting companies and robotics manufacturers against lawmakers and worker advocates. The issue is taking on new urgency ahead of a Feb. 16 vote before the EU Parliament’s Legal Affairs Committee on whether to create a robotics agency to deliberate on tax and liability issues. Companies from Google to Boeing, from Siemens to Foxconn Technology Group, have jumped on the automation bandwagon in the last few decades (Chart 1). At the forefront of the robotization drive, which has been dubbed the “Fourth Industrial Revolution,” are countries like Germany, the U.S., South Korea and the U.K. (Chart 2), and such manufacturing industries as automotive parts suppliers and the electrical and electronics industry. For companies, the math is simple—use of robotics reduces their labor costs and increases productivity as robots have become cheaper and easier to program. According to a 2013 article in the MIT Technology Review, warehouses equipped with robots manufactured by Amazon Robotics, for instance, can process four times the amount of orders as unautomated warehouses. Robots—then still large, unwieldy and expensive—first entered the marketplace in Europe, Japan and the U.S. in the 1960s. 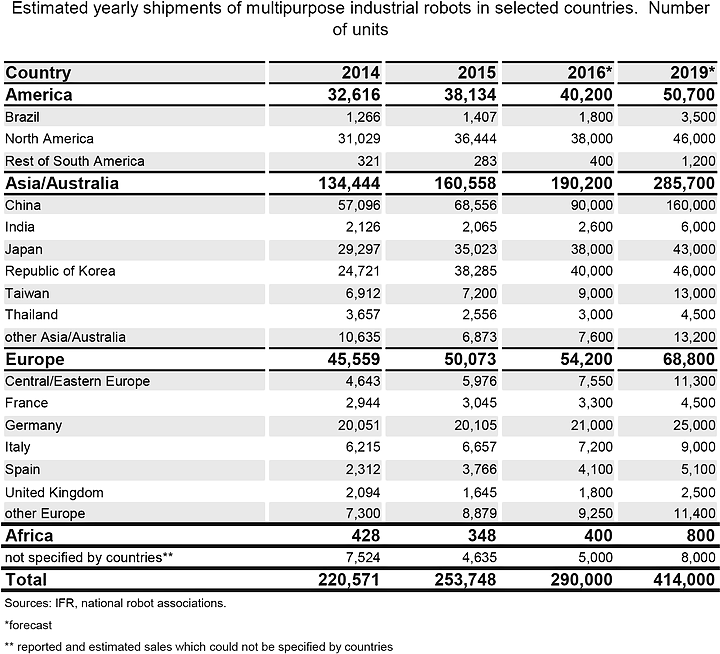 Boston Consulting Group estimates approximately 1.4 million industrial robots are today in use around the globe, a number that is projected to increase to 1.9 million in 2017. 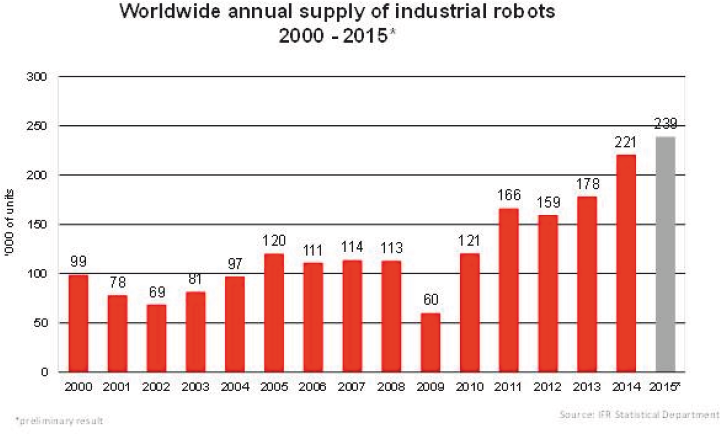 Robotics manufacturers, unsurprisingly, are riding a sales boom, with many of them reporting two-digit percentage increases in revenue (chart of Denmark’s largest robot manufacturer, Universal Robots, revenue between 2013 and 2015). The robotics industry today represents a $15 billion sector, which is expected to increase to $67 billion by 2025, also according to Boston Consulting Group figures. How many jobs will be lost in this inexorable drive toward automation is a question that no one can quite seem to agree on. The answer to this numbers question matters because the fear of massive job losses is one of the central arguments used by those in favor of a robot tax. “Who will buy products and services realized through use of robotics if those taken out of a job by them have no income?” said Barb Jacobson, a board member of Universal Basic Income Europe, a lobby group promoting basic income in Europe. But rather than focusing on diminishing employment prospects, some say, we should be examining the relationship between unemployment and automation. “I think we need to have proper evidence that robots have a negative effect on employment and right now we’re not really seeing anything in the data to suggest that,” said Gregory Claeys, a research fellow at the Brussels-based think tank Bruegel, in a Feb. 3 telephone interview. This view was echoed by Patrick Schwarzkopf, director of the Brussels-based EUnited Robotics trade association, who pointed to data (Chart 3) from the International Federation of Robotics indicating high employment rates for countries with high robotization levels. Both robotics manufacturers and economists moreover tend to point out that automation also creates jobs. A 2015 Deloitte report for instance concluded that technology potentially played a part in the disappearance of 800,000 lower-skilled jobs between 2001 and 2015, but also contributed to the creation of almost 3.5 million higher-skilled jobs. Extensive studies by consultancy firms such as Deloitte, McKinsey&Company and Accenture indicate that jobs in highly structured and predictable environments such as manufacturing, transportation and logistics, as well as in office and administrative support are most at risk of automation. In other words, the wide net of jobs most at risk of disappearing includes assemblers of electrical products and bank clerks, typists and personal assistants, retail cashiers and couriers, tax preparers and data entry specialists. 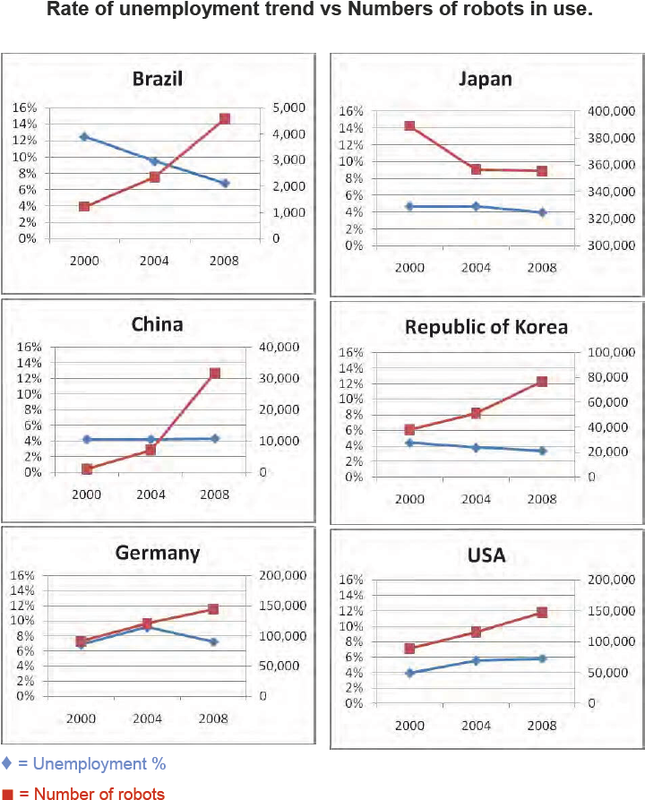 No matter their scope, sizeable job losses due to the automation of work are likely to result in not just an idle workforce, but also plummeting tax revenues for governments since companies, employing fewer people, would result in fewer social security and income tax take, causing erosion of governmental tax bases. A European Parliament report released in May 2016 was the first serious effort on the part of European lawmakers to address these mounting concerns, discussing such robotics-related issues as liability, compliance with ethical standards and the viability of European Union countries’ social security systems if the current taxation basis isn’t revised. A “yes” vote would require the commission to present a legislative proposal in response, or state its reasons if it refuses to do so. The May 2016 report was penned by European parliamentarian and member of the Group of Progressive Alliance of Socialists and Democrats, Mady Delvaux. She said it was important to both analyze all the possible scenarios and launch a debate on new employment models and the sustainability of European countries’ tax and social systems in light of robotics developments. “Taxing the work of robots is definitely not necessary at this stage and probably not even in the near future. But it is crucial to reflect on it and I want Europe to be prepared in case we are facing job displacement by robotics in the future,” she said in a Feb. 9 statement e-mailed to Bloomberg BNA. Benoit Hamon, a Socialist Party candidate running for the French presidential elections, would beg to differ. Citing figures that projected a loss of 3 million jobs due to automation in France by 2025, he recently called for the introduction of a robot tax to fund a 750-euro ($799) basic income. His office didn’t respond to requests for comment. Practitioners say lawmakers like Hamon raise pertinent questions about the need for a rebalancing of the tax system as robots increasingly begin to execute tasks that, until recently, were performed by humans. But, they warn, a levy that taxes companies’ use of robotics will be difficult to design and tricky to implement because it would require a practical and workable definition of “robots” and a clear-cut method of assigning profits to a particular robot or automation program. “Where does the value sit in a robot? Is it in the hardware or the software learning algorithms? This is a part of the BEPS issue on where businesses should pay tax,” they said in a Feb. 2 e-mail, referring to the OECD’s sweeping action plan to combat base erosion and profit shifting. Others warned that the difficulty of designing a workable definition for robotics and determining where they create value would increase uncertainty for the companies leading the automation charge. “My everyday experience of dealing with corporate clients is that the biggest problem of taxes for them isn’t actually the amount of it; it’s not knowing how much they might have to pay,” said Robert Leggett, a partner at Ensors Chartered Accountants, in a Jan. 31 telephone interview. A robot tax would further compound these uncertainties because the amount in profits a robot generates for a taxpayer and the corresponding number of human workers displaced won’t always be “obvious”, he said. “So you’re going to almost have to come up with some much more arbitrary way of deciding what that tax is, and I’d be very worried that if that’s not absolutely clear, you get into certainty for the business that doesn’t actually know how much tax it’s going to have to pay,” he said. Practitioners, industry groups and economists have warned that a robot tax would also reduce the incentive for companies to innovate and potentially prompt them to relocate to other jurisdictions that don’t levy taxes on automation technologies. The road ahead might look uncertain, Gagliardi and Steveni added, but European countries should only consider running with Hamon’s idea if they can come up with a tax definition of a robot that isn’t so broad as to include all machines, or so narrow as to require constant revisions as technology evolves.